Can you believe its September already? That means holidays are just around the corner. Yesterday, when we went to Walmart the store already has an aisle for Halloween candies, and Thanksgiving decorations. This month is also special for Charles as he is celebrating his 6th birthday. Today, he asked me if its his birthday already and I said no; nineteen days left before your birthday. I also told him that we are not going to decorate for his birthday and his ok with it as long as we are going to play golf, bowling and go-kart racing. Now, that its September, Christmas songs surely can soon be heard on the radio, or television commercials just like yesterday. It’s the Most Wonderful Time of the Year, was on a commercial then Charles said; what’s that? Its not Christmas, I thought it was funny when he recognized the song. Well, only a few weeks left before the summer comes to an end. So far, the weather has not been really bad here in Northwest Arkansas, and I am so grateful for that. Unlike the other parts of the country who’s affected by severe weather, like flooding, drought, and tornadoes. Anyway, how was your weekend so far? I’m sure you really enjoyed your longest weekend of the summer. As for me, I had a great week especially on Sunday night watching NASCAR Sprint Cup in Atlanta. Never thought Kasey Kahne could end up winning as the race started and was dominated by Kevin Harvick, who lead the most laps in the race. The last 3 laps were just like an eternity when then the cautions came out. Boy! It was really a great race, well deserved win to be in the chase for Kasey Kahne. It made me happy also 4 of Hendricks Motor Sports teams are in the chase. Most of all, Danica Patrick, had the best finish of her career, 6th place. I do believe now when things are meant for you no matter how things did not turn out the way you wanted, in the end it still could be great for you and very fulfilling. If you are looking for the best in musical instruments and all products for music production then look no farther. Join now. Only the best in everything from guitars, bass, drums, keyboards and every other instrument you could ever dream of. Also available are great mixing tables and all the midis you could ever want to make your own professional music. I can not believe its almost 7 years already since I came here to the U.S. It was football season and I have no idea what football was until I saw it on television. The first time I saw a football game on television I thought it was crazy. Why are they running around from each other and chasing the ball to get it into the end zone? To me it was cheesy and makes me dizzy trying to figured out what they’re doing on the field. Of course, Doug was a football coach during the time I came here in the U.S., so he explained to me everything though I still could not understand it. Every weekend we watched football games whether its college or NFL games and so far I am enjoying watching the games. The most exciting games was when we watched the games at the stadium in Columbia, Missouri, and Arrowhead Stadium, home of the Kansas City Chiefs. Well, this year hopefully we can watch another Mizzou football games in Columbia, or even here at school where Doug, teaches at. Its more entertaining and fun to watch the game at the stadium rather than television. The crowd goes wild when the home team scores a touchdown. Of course, the loud music playing is just like a party already and who doesn’t like seeing those cheerleaders dancing and the marching band during halftime? 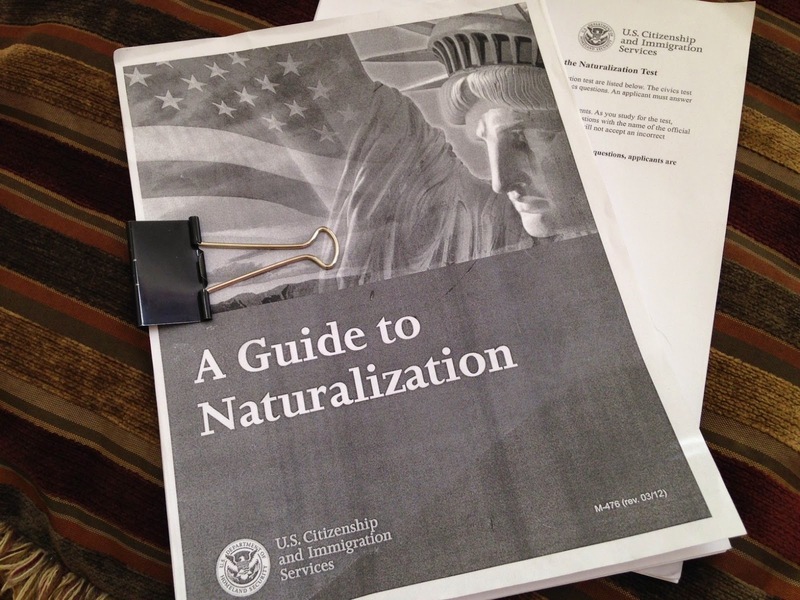 Anyway, I was organizing my magazines and noticed printouts about, A Guide to Naturalization. Since I already lived here for nearly 7 years (5 years minimum) as a Permanent Resident, I am eligible to apply for Naturalization if I want to become a U.S. Citizen. Changing my citizenship is also one of the biggest decision on my life. Doug, has always encouraged me to change my citizenship over the years but I was the one who’s ignoring it. I also worried about the test so I must prepare for this before I say lets do it and get it done. These questions are easy as long as I am prepared before the test. There are 10 questions out of 100 and I must answer 6 out of 10 questions. Filing and biometric services fee are $680.00 total. If I don’t pass the test it would be just a total waste of money. Its not like okey, come back again next month until you pass the test. Well, I do really have plenty of time to read and study all these questions before I apply for my Naturalization. For the meantime I will not worry about changing my citizenship when the right time comes, I’ll do it. If you are a renovator of cars and or furniture I am sure you have came across a need for repairing and replacing seats sometime. It is better to repair them then to replace them. It is important that you find a good deal and a great place to find cushion foam online is just what the renovator like you can use to finish your projects.